I could have taken the “grand road” and stared with…..”Hello, I’m Stephanie a 20+ year human resources professional, author, career expert, speaker, former radio host and publisher of CAREER Magazine”, but I paid attention to their “what the heck is going on here expressions” as he got up to tell them, “I have my God-sister here and I asked her to share with you” Their faces said….Who is she? What does she have to say? Do I really have to listen? So I started off with, “My name is Stephanie C. Harper and I’m from Fairfield, CA”. It was intended to be an ice breaker to make them laugh, but it ended up being pivotal. For those of you who are not familiar, Fairfield is a small town about 1 hour East of San Fransisco where every grew up knowing everybody. I shared my journey with the girls about being from a small town, moving to Los Angeles 3 days after high school and then moving to Atlanta at the age of 28 – – -where I blossomed – – where I BECAME! I shared the highs and lows I had experienced and how each high and low was necessary to my ultimate success. I shared about writing my first book, after losing everything and sleeping on a girlfriends couch, and how THAT changed my life and my career FOREVER. I shared about how I became known as a “career expert”, how I ended up on the radio reaching 2.5 million people with my career tips, how I turned my name into a brand (and how I have had to be very protective of it because it’s no longer just my name). I shared with them how I felt to Google myself and be #1 on Google and have a nation full of people take an interest in “my advice”….the girl….from little ole’ Fairfield, CA. During the “success session”, I talked about affirming yourself and how success is a personal matter and YOU are the only one who has the ability to define your success (and likewise, you are the only one to blame for failure). I talked how it’s important to never compare yourself to others but to set your own standard of success, because the reality is…someone’s success is just being the first person in their family to graduate from college (which ended up being one of the areas someone in the group was striving for). After talking about affirmations, I then challenged each young lady to reflect on what they heard and state a positive affirmation about themselves. In the beginning many of them had no reflection and no affirmation. By the time the session was over, there were tears, hugs, sighs of relieve, discovery, healing, secrets exposed, etc. In the end EVERYONE had a reflection and an affirmation. I’m a survivor, I will love myself first, I am strong, I define my success, I can’t be stopped, My value isn’t what I do, my value is me, My life, my choice, etc…. Because I don’t believe in “motivating for the moment”, several of the young ladies were referred to ladies in my network who I made contact with last night and this morning, who will happily become success partners to these young ladies in the form of mentorship and accountability….and yes, several of them took out there phones and asked…”can I call you?” Of course, they can! 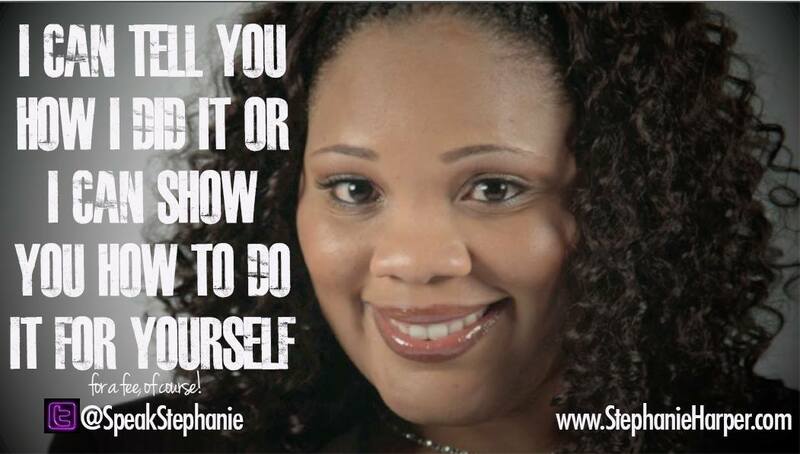 My name is Stephanie C. Harper and I’m from Fairfield, CA. And….and pound, hug, thank you to my god-brother….for trusting me as the vessel!